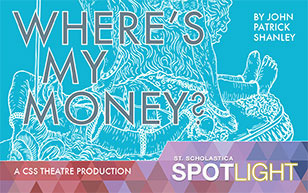 St. Scholastica Theatre will stage the dark comedy "Where's My Money?" by John Patrick Shanley, starting Feb. 1. The story examines the pitfalls of marriage and relationships, and how past decisions can haunt our present and dictate the future. A chance meeting gives out-of-work actor Celeste and her old acquaintance Natalie an opportunity to catch up. Natalie, an accountant who is married to a lawyer, appears to have her life in order, but in reality she is being haunted by an ex-boyfriend who claims she owes him money. Warning: the language and content in this performance may not be suitable for all ages. Evening performances will be at 7:30 p.m. on Feb. 1-2 and 7-9. Sunday matinees will be at 2 p.m. on Feb. 3 and 10. The show is directed by Kelly Mullan, a lecturer in the Communication, Theater and Art Department. She said the play centers on creation and destruction in marital relationships, as inspired by the mythology of Kali, the Hindu goddess of creation and destruction. Kali, Mullan said, symbolizes the fact that the human ego must be destroyed before self-fulfillment can be made possible. "Where's My Money" is a short play with five scenes in one act, and no intermission. Tickets are $15 for adults and $10 for seniors and students. For more information, contact: spotlight@css.edu or 218-723-7000. St. Scholastica Theatre's 2018-19 performance season will conclude with the comedy "The Fan," which opens April 5.